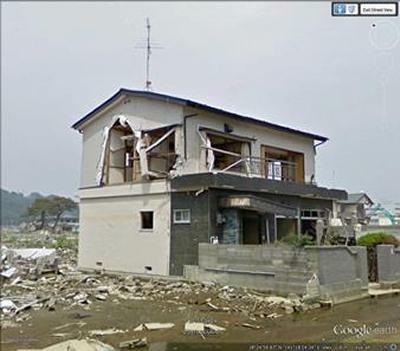 Tsunami damage to a timber framed building in Ishinomaki, Japan. The research, published in the Institution of Civil Engineers’ (ICE) journal Civil Engineering, studied images taken before and after the 2011 Japan earthquake to assess the impacts on buildings from the devastating Tōhoku tsunami, which hit the east coast of Honshu, Japan. 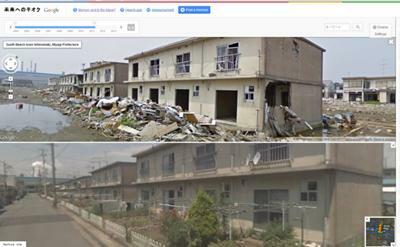 Following normal field team investigations to assess damage and provide information to aid future design guidelines, Google Street View cars were sent around major cities and coastal areas, photographing streets over a six-month period starting four months after the tsunami. Images were compiled with those taken before the event to produce an accessible digital archive to allow comparison of the ‘before’ and ‘after’ situations. The resulting images were displayed online (Google Street View, 2011). Southampton researchers compared images from two Japanese cities, Ishinomaki, on a coastal plain, and Ofunato, on a ‘ria’ coastline with steep coastal valleys. ‘After’ images were used to identify the material and form of structures that remained standing, which were logged by location and graded on a damage scale. Buildings that could be used for sheltering and siting of structures to serve as vertical evacuation centres were also assessed. Study co-author Dr Alan Bloodworth, Lecturer in Engineering and the Environment at the University of Southampton, said: “We found that much of what is observable in the field is also visible in the online archive. The Google Street View cars created a new resource for remote assessment of structural performance, quantitatively by type and location and qualitatively for beneficial design features, such as sheltering by trees and other buildings.